Saw Avatar last night. Terrible. It was all blurry. Bored, I looked around to see if I knew anyone but everybody was wearing dark glasses. The first colored person I saw was when I went to Blue Man Group in New York several years ago. The Blue Men are still around. They used to just be in New York, but now they can be found in Las Vegas, Chicago, Olando, Boston, Tokyo, Zurich and Berlin as well. They are MULTIPLYING! The Blue Men dress in black clothing and have thick blue grease painted over latex bald caps. As well as being known for being blue, they are recognized musicians and play a mixture of idiosyncratic, often percussive, instruments. My next encounter with people of color was when I went to Avatar earlier this year. Well they weren't really people of color. They were humanoids of color - Na'vi - a ten-foot-tall blue-skinned species of sapient humanoids. But they weren't real. Not like the original Blue Men. There was about a fifteen year gap between me seeing the original Blue Men and seeing Avatar with the pretend blue humanoids. But now people of color are appearing with increasing frequency and I'm more than a little concerned! I haven't got time to list all the close encounters; a few will have to suffice. Look at this little guy on the left. 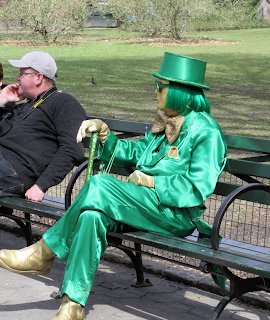 I almost didn't notice him, he was so nondescript for New York. 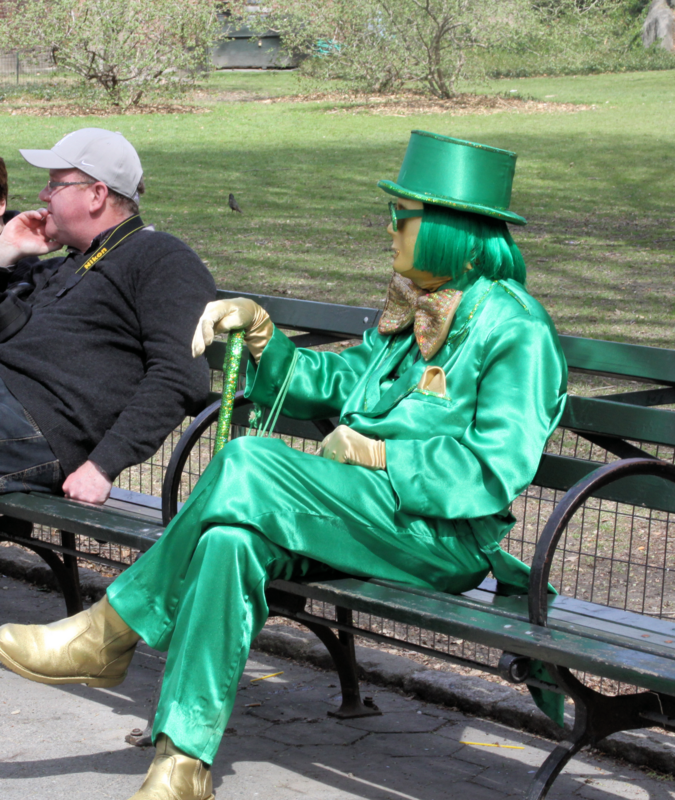 I spotted him in Central Park and expect he was tourist. An out-of-towner as they say here. But from where? From the mid-west (most likely) though he could be from another galaxy. The only other explanation I can offer is that he was Sarah Palin dressed up in drag. I'm currently leaning toward this explanation. If anyone has any other thoughts on the matter, please post a comment. I doubt that the next colored person I saw was Ms. Palin though. True, he was green, but I strongly suspect he was really a he in this case. You can't really see his skin properly here, so you'll have to take my word for it. He was dressed up as the Statue of Liberty and was directing traffic. 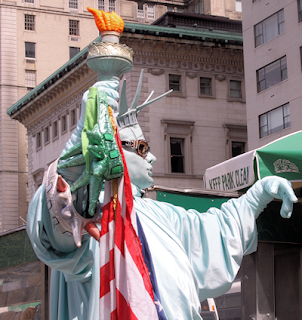 I might have believed that he really WAS the Statue of Liberty, but closer scrutiny reveled he was wearing glasses that looked suspiciously like the glasses the members of the audience have to wear when watching Avatar. I am not sure what to make of this. But whatever the reason, it is a worry. Green man wants to be blue sentient humanoid? Of course there's always the possibility that he is color-blind. Let's hope that's all there is to it! Then there was the yellow fairy. I took a photo of her because I knew I would NOT be believed otherwise. The fairy was yellow from head to foot. Even her clothes were yellow. She was standing all alone in the middle of the path, near 72nd Street. I suspect she'd wandered over from Strawberry Fields. She was definitely a Lucy-in-the-Sky-with-Diamonds sort of creature. Very fey. But why was she wearing ballet shoes? Later I came across a creature that must have been related to the yellow fairy. Similar looking. But THIS one was dead white. Lucy-in-the-Sky crossed with A-Whiter-Shade-of-Pale. Note how no one is taking any notice of her. I suspect this is because the colored people are becoming increasingly common here in New York. Scary stuff. Today it is Easter Sunday, and I was hoping things would get back to normal. But it was not to be. Wandering down to the East Village to buy a pie, I came across a gray-green creature - very similar to the traffic-directing Lady Liberty with the Avatar glasses. This one was even scarier. She was wearing sunglasses and pretending to be the Pope. I suppose she thought it was topical, it being Easter. But instead of blessing people and defending pedophiles, she was blessing the New York skyscrapers. A blasphemous Lady Liberty Pope wannabe! It's getting so that us New Yorkers are fearful of going to sleep at nights. Who knows what tomorrow has in store for us? We are a city known for its lack of color. We all wear black in winter, white in summer, and shades of gray in spring and fall. What's with the infiltration of color? Is some one trying to tell us something? And if so, who? Fellow New Yorkers, we need to be defensive and vigilant. Next thing we know we'll be required to wear polyester! 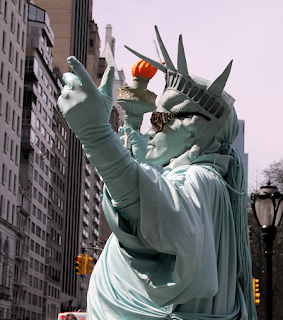 I close with an important message to all New Yorkers this Easter Sunday. That's one way of establishing an identity. Don't see people around The Old Pueblo dressing up as cacti, or coyotes. They don't have to 'cause they look different from Wall Street types all the time: cowboys who are really cowboys, cowboys who aren't cowboys but gardeners, Mexicans who are (mostly) Mexicans or U.S. citizens of Mexican descent. Oh yes, we have one odd woman who walks down Oracle Road dressed like a southern belle complete with a parasol, but I think she's just a whacko. Hmm, are your New Yorkers whackos? Or are they selling something? Themselves? Maybe when Jo comes home he could dress up as Popeye and you could go with him as Olive Oyl? Nah, don't think he'd go for it. Me, I'd love to be Buck Rogers myself. Think that'd fly? Back to work after four days off. didn't see any of these types around. The only colourful people were footballers. Even the kids collecting for the Royal Children's Hospital were subdued this year. As for polyester -we will send you Bob Downe! 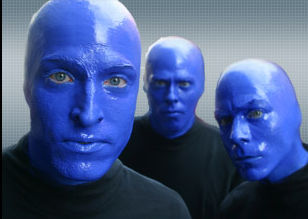 BLUE Man Group is cool, but they never smile, they must be sad AND BLUE. LOVE the YELLOW Fairy, might be the Tooth Fairy in which case she needs a whitening. Ah WHITE Fairy, amazing what one can do on a lunch hour. What about the RED people?